I’m so excited to welcome author Shelley Adina to the blog! Shelley is the author of a mind-blowing 30 books, from steampunk to romance to Amish fiction. Her book, Lady of Devices, was my introduction to steampunk, and I’m now gobbling up the series, cheering for the spunky Lady Claire as she dominates at engineering and chemistry in between making witty Victorian retorts. Listen in as this prolific writer talks costume design, chicken rescues, girl power, and teatime with the Duchess of Devonshire. AS: Welcome, Shelley! We all know that good writing comes from good reading. So tell us–what are some of your favorite books? SA: The list is so long I hardly know where to start! I cut my teeth on English authors like Elizabeth Goudge (The Little White Horse and Linnets and Valerians were my favorites). Then I read the grandes dames of suspense, like Victoria Holt, Mary Stewart, and Phyllis Whitney. When I got into publishing, I read books by people I knew and liked personally—Jennifer Crusie, Kristin Hannah, Bella Andre. Now I read all over the place—mysteries by Donna Leon and Linda Castillo, steampunk by Scott Westerfeld and Devon Monk, urban fantasy by Jim Butcher. AS: You wrote your first novel when you were 13. What was it about? SA: Since I read all the Nancy Drew books one after the other, my first novel was a total Mary Sue/Nancy Drew, with international art thieves and cruise ships and three teenagers who solved it all. My happiest hours were spent writing that book, on yellow typing paper with dots of white correction fluid. Sadly, when I sent it off to a publisher, my budding genius was not recognized and it came back with such speed I wondered if they’d even opened the envelope. But inside was a letter saying that while they were declining, they could see I knew how to tell a story, and to keep going. So I did. AS: What are some of your non-writing hobbies? How do those inform your writing? 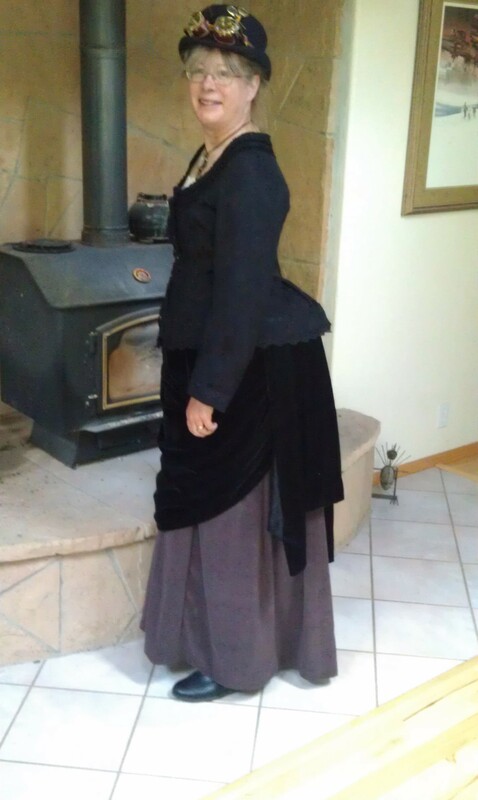 Shelley in a Victorian costume of her own making! AS: You’ve done quite a bit of traveling. Is there a place that’s particularly inspired your writing? SA: So far I’ve been to 27 countries. But London inspires all kinds of steampunk ideas—which isn’t surprising, since many books in the genre are set there. I’ve been there four times, I think, the most recent in 2012, when I was researching the locations in the Magnificent Devices series, like Bedlam, and Wilton Crescent, and Vauxhall. AS: What’s the best thing about being an author? The hardest? SA: The best thing about being an author is hearing from readers who enjoy living in my world as much as I do. I say, the more the merrier! The hardest thing is curbing my impatience to write everything all at once. I have books laid out for the next two years, and it’s like reining in the mental horses when I want to do it all at once! AS: You write in a variety of genres: steampunk, romance, young adult, even Amish women’s fiction. Do you see common themes that link your books together? SA: Oh, yes. After 30 books, I’m discovering that writers often have a “core story” that they can’t help but express on the page, no matter what the actual plot of the book is about. My core story is the young woman breaking free of the cage of other people’s expectations to find her own path. It seems that no matter what genre I write in, some aspect of that core story comes out. Maybe that’s why people like them—because it’s a kind of universal experience that’s at the same time specific to that book and that character. AS: As a hybrid author, you’ve self-published some of your books and had others traditionally published. How would you compare the two experiences? Do you prefer one over the other? SA: My current publisher, Hachette, has been very good to me and I adore my editor, Christina Boys. The tradpub and selfpub experiences are very different, but these days, most of the marketing falls on the author no matter which path you take. I love the control that I have with self-publishing, in scheduling the books, in writing them, in not worrying about whether this or that will be acceptable to someone in marketing. All that matters is whether it’s acceptable to the reader, and I love that direct connection. AS: If you could have tea with anyone, living or dead, who would it be and why? SA: Wouldn’t it be lovely to have tea with the Duchess of Devonshire (1757–1806)? She was such an influential woman in a time when women were only expected to be decorative and produce children. She had star power, that girl. And a difficult life, for all her wealth. AS: What’s one piece of advice you would give to aspiring writers? SA: First of all, read widely. One of my biggest fears is that I’ll be derivative, so I love to read what others are coming up with. I’m amazed at the power of the imaginations out there. And secondly, don’t be afraid to pull out all the stops and push your own limits. Stretch yourself so that you can find your own space in which to create worlds and people that are unique to you. AS: What’s next for you? • Herb of Grace, book 1 in my Healing Grace series written as Adina Senft, comes out on August 5. I turn in book 3, Balm of Gilead, on August 15. • Immediately afterward, I begin work on The Leftover Bride, a romance set in Lucy Kevin’s “Four Weddings and a Fiasco” Kindle World. • Once that’s done, I begin work on A Lady of Integrity, book 7 in the Magnificent Devices series, which will take me to the end of the year. • In between all these, I’m re-releasing my All About Us teen series, which will be renamed the Glory Prep series, with all new covers and updated content. A busy remainder of 2014! Thanks for stopping by, Shelley! Find Shelley online at http://www.shelleyadina.com and http://www.adinasenft.com. Sign up for her newsletter or friend her on Facebook. Or chat with her on Twitter @shelleyadina ! If you have a question for Shelley, leave a comment! She’ll be around to answer it today! Next > Book Launch Party!